For minor strains, sprains and arthritic conditions. Uniform compression promotes circulation, helps reduce inflammation. 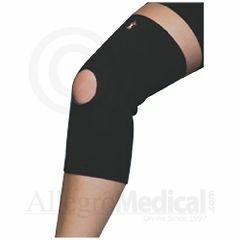 Open patella has double padding over kneecap for extra warmth and compression. Contoured fit for comfort; 12" (30cm) slip-on sleeve. I would have liked more compression. I would prefer a brace without stitching and that gave more compression support with a closed knee.